Today I’m thrilled to have both Jeff Cohen and Brandon Checketts on the show. Now Jeff has already been on the podcast in episode 120 where we talked about reviews and how to get ranked in Amazon. But today we are blessed to have Brandon Checketts on the show as well. Brandon is actually the founder of Seller Labs and was the original programmer and developer of Feedback Genius and Ignite. What I like about Jeff and Brandon is that they are always on the ball when it comes to Amazon and I wanted them on the show to talk about the product launch process especially in regards to Amazon sponsored ads. Enjoy the interview! How to run a product launch today. 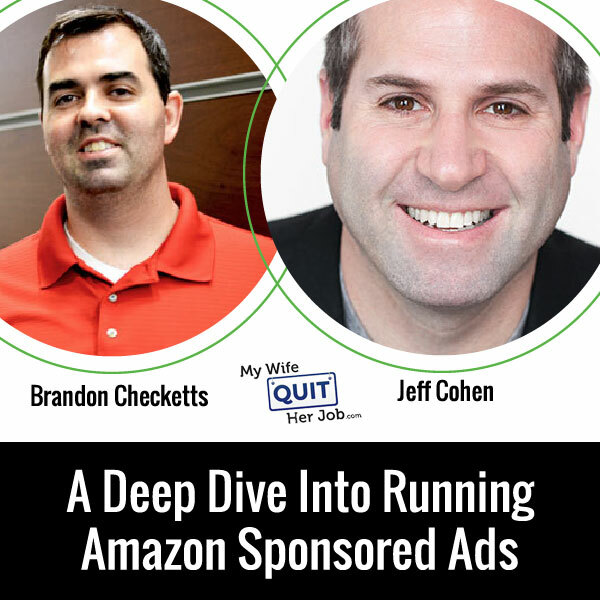 Today I’m thrilled to have both Jeff Cohen and Brandon Checketts from Seller Labs on the show, and between the two of these guys they have tremendous experience when it comes to selling on Amazon and they work with so many different companies to formulate their strategies. In today’s episode we delve super deep into how to run profitable Amazon sponsored ads the right way. Now before we begin I want to give a quick shout out to Seller Labs who is a sponsor of the show, and specifically I want to talk about their brand new tool Ignite which helps sellers, you guessed it manage their Amazon sponsored ads. Now I’m excited to talk about Ignite because I’ve been using this tool to manage my own Amazon sponsored ad campaigns, and it makes things a heck of a lot more convenient. Number one, I’ve always found it a major pain to generate my PPC reports on Amazon, cut and paste the data over to an excel spreadsheet and use pivot tables before I’m able to do any analysis. Well Ignite allows you to aggregate and visualize your data quickly right within the tool to see what keywords are working and what are not immediately, no need to manually create reports or play with excel. Second of all unless you’re a data geek, Amazon campaign data can be hard to interpret, and what’s cool is that Ignite makes keyword and bidding recommendations on the fly that can be applied with a couple of clicks. So let’s say one of my hankie keywords is bringing money, Ignite will alert me of that fact, and I can reduce the bid immediately. So bottom line Ignite makes managing your Amazon sponsored campaigns so much easier and the fact that they provide me with alerts means that I no longer have to monitor my campaigns like a hawk. If there are keywords that are doing well, Ignite tells me to add them to my exact match campaigns. If my keywords are losing money Ignite tells me to either remove the keyword or to reduce the bid. So head on over to sellerlabs.com/steve where you’ll find awesome tutorials on how to run Amazon PPC ads and the opportunity to try Ignite for 30 days for free. Once again that’s sellerlabs.com/steve, now on the show. Steve: Welcome to the My Wife Quit Her Job Podcast, today I’m thrilled to have both Jeff Cohen and Brandon Checketts on the show. Now Jeff has already been on the podcast back in episode 120 where we talked about reviews and how to get ranked on Amazon, but today we are blessed to have Brandon Checketts on the show as well. Now Brandon is actually the founder of Seller Labs and was the original programmer and developer for Feedback Genius and Ignite. Anyways things have changed dramatically since that first interview that I did with Jeff a while ago, for one thing incentivized reviews are no longer allowed which has forced a lot of people to understand how to launch a product without shortcuts and how to use Amazon sponsored product ads. Anyways what I like about Jeff and Brandon is that they’re always on the bar when it comes to Amazon, they are the brands over at Seller Labs, and chances are if you’re selling on Amazon you’re probably using one of their awesome tools already. So for example right now I’m using Feedback Genius, and recently I’ve actually been using Scope to peer into what keywords competing products are ranking for, and I’ll probably write a blog post about that soon to report my results. Anyways I wanted Jeff and Brandon on the show today to talk about the launch process, an up-to-date launch process especially in regards to Amazon sponsored ads. And with that welcome to the show Jeff and Brandon, how are you guys doing today? Brandon: Great, thanks for having us on. Jeff: Thanks Steve, thanks for having me back. Steve: Yeah so Jeff and Brandon why don’t we start off with what has changed relatively recently and how that has affected the launch process? Jeff: Yeah Steve, so we all know kind of what happened in October and basically for those that are not aware Amazon in October came out and said that if you’re giving products away in exchange for a review it’s now a violation of terms of service, and a lot of sellers were using this technique to get their initial sales and to drive sales to their products and to get reviews for their products. So it leaves this problem in the world where sellers have to have reviews to get sales but they need sales to get reviews. And so today Amazon sellers have to look for new ways to kind of launch their products. Jeff: So the way that I kind of describe it is there is black hat tactics, there is grey hat tactics and then there is white hat tactics, and for people that aren’t familiar black hat tactics are those that are going to get you immediately suspended. I typically don’t talk about black hat tactics, but there is a couple that I want to share because I think a lot of sellers are not completely aware of this. If you’re a seller on Amazon you’re probably getting approached either on Skype or on Facebook or even through your seller central account being asked if you want somebody to rank you for SEO. Typically these people are coming from India and they’re making these big bold claims that they’ll rank you on page one. Most all of their tactics are black hat and are going to get you in trouble, and anything that you do with them is going to be very temporary in what’s done. To really build a business that’s sustainable over a long period of time you need to look to build tactics in your business that are going to help your business grow and not get your business in trouble. And so I really try to caution people that these might sound very incentivizing and they might sound very attractive the first time you see them, but they’re not worth the effort or the gain that you get from them because Amazon is cracking down on them really hard. So that kind of leaves us with this big question I like to ask, it’s WWJD, so what would Jeff do? When it all comes down to it we need to have a new way of thinking about our products and about our launch. And so I really break this down into four categories. I break this down into reviews, sessions, conversions and ranking, and so we can kind of walk through all of this and talk about how all of this kind of builds into the launching of a product. Ultimately Steve it all starts with getting your product ranked and optimizing for that rank. Steve: Okay, so let’s walk through the process. Jeff: Great so to make it really simple poor listings equal poor search, and as an Amazon seller you have to look at your listing and understand what your listing is telling the Amazon algorithm. So the Amazon algorithm is a bird that’s going to look at all of the information that you give and it’s going try and match things up and it’s going to – I like to use the example of an apple slicer so I’ll stick with that one. If I tell Amazon that my product in the title is an apple slicer and somebody searches for apple slicer, Amazon can connect my product with the buyer’s search desires, but if I call my product a fruit corer and somebody searches for an apple slicer then Amazon can’t necessarily connect what the buyer is looking for and my product. So you really have to start with optimizing for search and to keep it really simple poor listings get you poor search and good listings get you good search. Steve: Okay and specifically what you’re talking about right now are the backend keywords and the title right now not necessarily the quality of the listing, right? to use in your listing. So how about I walk you through kind of a really simple example of that. Steve: Yeah let’s do it. Jeff: Okay so what I would do if I was listing a new product on Amazon is I would find my competitor and I would pull them up and I would use what’s called a reverse ASIN tool, and so you could use the tool by Scope or there is other tools that are out there, and what these tools are going to do is they are going to tell you what keywords that ASIN is ranking for. And what’s important about that is that the way Amazon’s algorithm works is that if a product is ranking really high for a keyword that means that that keyword is driving sales for that product. So I want to use that information to help build my listing, so I can take the most important keywords from my competitor’s listings and I can use those keywords to build out my title, my bullet points, my descriptions and my backend keywords. This is feeding the Amazon algorithm all of the important information that’s necessary about my product and I’m no longer guessing what actually my product is going to – I’m not actually guessing how a user is going to describe my product, I’m using actual search terms that are driving conversion. Steve: Okay yeah that’s really powerful. I think traditionally the way people were doing this is they were using Amazon auto campaigns to kind of mine keywords that they wouldn’t think of. I guess this is where you can kind of jump straight to see what the other competitors are using and just start using those keywords directly and kind of bypass that automated step, is that right? Jeff: Yeah so the use of sponsored product ad auto campaigns was definitely the way that you would get competitive information in the past, but now you’re actually able to get that information before you start selling, so by being able to use that information before you start selling you can kind of bypass that whole process. So what I recommend is that when your product sets are coming over or you’re getting ready to list them you’re waiting for Amazon to add them to the warehouse inventory that’s when you want to build your listing for rank, and that’s when you want to use your competitor keywords to build your listing because those are the most rich keywords that you can use at the beginning of your launch cycle. Steve: Okay and once you have those keywords and assuming that you’ve created your listing correctly what is the next step, like we don’t have incentivized reviews anymore, so do we just let it organically go, or what is your advice there? Jeff: So the next step is really to follow exactly what you said which is that you can use a tool that Amazon has called Amazon sponsored product ads to start driving traffic to your listing. There is kind of this misconception that you have to have reviews to get sales, but that’s not necessarily true. So I launched a product after October and I wanted to launch the product strictly with sponsored product ads to demonstrate that you could do this. What I was able to do is I was able to get my first five or ten sales. Now I will be totally honest with you I actually lost money on those products because I wasn’t trying to have a profitable click to conversion ratio with my sponsored product ads, I was just trying to use Amazon’s traffic to drive sales for my products. I then followed up with my follow up sequence and was able to convert a couple of those to reviews. Steve: Okay so your ACOS was so high that you weren’t profitable? Jeff: Oh I think it was like 200%. Steve: Okay, so is that necessary today like when you have no reviews obviously the sponsored ads aren’t going to be as effective, right? So are you suggesting that we should just run sponsored ads with zero reviews just to get those initial five or ten reviews on our product? Jeff: It’s not the only way for you to launch a product but it’s definitely a way that you can launch your product, and I don’t think that you have to do a 200% ACOS to start driving sales, I think you’ll start driving sales. I don’t think people who look at sponsored products ads and click on the ad are as concerned about reviews as normal shoppers are, and so I think with zero reviews or even just one or two reviews your sponsored product ads start to work. Steve: Okay so one thing I’ve actually started noticing is that ever since October when they banned incentivized reviews my sponsored product ad costs started increasing, I guess because people started flocking to it, right? And so in my mind at least for me I feel like we have to make more efforts in optimizing these campaigns now because everyone is flocking to these tools, are you guys seeing the same thing? Jeff: Yeah and I think that’s why we recommend kind of a different way to run a sponsored product ad campaign, so I’m going to kind of walk you through the old way of doing it and then I’ll let Brandon kind of jump in and talk about the new way of doing it and why it’s more effective. Steve: Okay yeah that sounds good. Jeff: So the old way of running a campaign was that you would do what Amazon calls an auto campaign. An auto campaign is basically connecting an ASIN to a sponsored product campaign and Amazon just starts to figure out all the different keywords that a product might or might not rank for. And so if we’re using my apple slicer using an auto targeted campaign, Amazon might show my ad for a fruit cutter, they might show it for a kitchen gadget; they might show it for a pineapple slicer. So Amazon is going to try to throw as big of a net in your auto campaign as possible. The old technique was really that you would run this campaign for seven to ten days, you would then get all of this data back, the impression data, and what’s called search term data which is the actual search term that a seller is looking for, and then you would take that data and you would use that to make your manual campaigns. In some cases seven to ten days wasn’t enough, you needed up to 21 days to start getting enough data before you could start optimizing your campaigns. So we’ve kind of developed a different methodology that allows you to start on day one and start to run campaigns that matter, so I’ll let Brandon kind of explain that. Steve: Actually before we jump to that just I had just a quick question about auto campaigns. We know that Amazon like the conversion rate really matters, so do these auto campaigns – sometimes they throw really random keywords, at least that’s what I’ve noticed looking though the spreadsheets. Does that actually hurt the listing by allowing Amazon to run these automated campaigns outside of just wasting money on these keywords? Brandon: I guess the thing I’ll say rather is just try to find definitive data on whether a wrong conversion rate helps you or hurts you, but there’s definitely a higher conversion rate is definitely going to help you not just on your campaigns but on your products in general. Steve: I guess what I’m trying to ask is by focusing on those keywords that you know are going to convert, does that help you more than just – does running auto campaigns kind of hurt you because you’re now driving traffic for these keywords that could be irrelevant? Brandon: It’s definitely going to be more of a waste of money than doing some of those more targeted and like I said it’s hard to find definitive evidence one way or another if like your automated campaigns are using poorly targeted keywords actually hurts your campaign. It’s definitely a waste of money because you’re advertising and people are clicking on things that are not relevant and they are not likely to buy your products, and there is anecdotal evidence there’s people who would say more definitively that it does hurt your campaign or kind in the ball pack like it’s still is a little hard to tell. Brandon: But I see people definitely saying like yeah they definitely hurt your campaign, and I think there is cases to be made for that. Steve: Okay so in that case let’s talk about the new methodology that you guys have. Brandon: Yeah so the thing that we recommend doing now is to – Jeff mentioned earlier these tools are like reverse ASIN tool. Essentially what they do is that they allow you put in an ASIN of either your product or a competitor’s products, and it’ll tell you all the keywords or the user search terms that that product ranks for. So using a tool like that against all [inaudible 00:17:18] one called Scope and there’s other ones out there, but they really tell you like what keywords or what user search terms people are looking for. If something ranks really well for one of those keywords those are generally will be pretty effective terms for you to use in your advertising, and so you can really just narrow really quickly on what really works. Steve: Can we talk a little bit about how such a tool would work, like how do you know what people are searching for, for all the different products on there? You guys have a tool, right, so how does it work? Brandon: Yeah it’s actually really complicated technical challenge because we have to perform searches on like 80 something million keywords, and then go through and find out the results for those and then save all the results then go look backwards in the database, look up a product and see which keywords it ranked for. Steve: You guys just actually type in keywords and then make note of what’s ranking for what and then just keep all that in a database, right? Brandon: Yeah that’s not too hard, if you say like that it doesn’t sound very complicated but try to do that at scale across 80 million keywords it’s a challenging work. Steve: Oh yeah I was just trying to simplify it for the listeners, if we get too technical then – yeah, okay. Brandon: It’s not very hard to do, you can arbitrarily you would do it but the problem is like we don’t know where those keywords are ahead of time, so we have to kind of go through all of them. Jeff: Yeah so a seller – Steve a seller could actually do this manually on their own, they could go to Amazon and type in the keyword and look at what results are coming up, but what we’re able to do is actually by looking at so many keywords we’re able to tell you what keywords are actually being used that you would never think of. So you might not ever think of calling your apple slicer a fruit corer and that’s kind of the advantage that you can get by looking at the data in a whole. So most sellers are probably used to tracking keywords in their keyword position, that’s a tactic that’s been used by sellers for a very long period of time, but that’s only tracking keywords that you know you want to track. What we’re able to do through our methodology is actually track 80 million plus keywords, and so we’re tracking keywords that you’ve never thought of and actually able to suggest keywords to you that you should be including in your campaigns or in your listings that are actually driving sales for your competitors. Steve: Okay so once – like assuming that all these tools work really well and I have a set of keywords, then would I just bypass that automated step all together, then the auto campaign? Brandon: Yeah we’ve seen a lot of people just bypass that all together. In general we recommend you can still run an automatic targeted campaign because they tend to do gather a little bit of data but I would use that as the primary source of things. It’s really easy just to start with those focused keywords that we already know are ranking and they perform a lot better than automatic targeted campaign does. We see a lot of sellers that do, if you go that automatic targeted route like it can take you 7 to 30 days in some cases to gather some relevant data and costs hundreds of dollars in the meantime just spending money experimenting with keywords. So we really short cut on both time and money by using modern tools. Steve: So let’s go a little bit more specific now, so let’s say I had these keywords, do you suggest doing phrase match, exact match, like how would you set up your campaign from the start assuming this is like a brand new product? most open of all the categories. And so if I’m using the word apple slicer it’s going to use words like apple cutter, red cutter for slicing apple, slicer for cutting apple, it’s going to look at terms with my keyword before, middle and after. Phrase is going to keep my term apple slicer together, and exact is only going to look at that actual term. It might add a misspelling or a plural or something like that. So what you want to do is use your competitor’s keywords and one of the tricks that we’ve kind of identified is that you want to make sure the keywords do not overlap, and that’s kind of a big thing that we’ve been sharing with our customers. So when you look at what I call overlapping keywords, if you have an apple cutter and you have an apple slicer, those are not overlapping keywords, but you wouldn’t also want to include the word apple cutter slicer because that’s an overlapping keyword and it’s going to steal impressions. So you want to take these keywords and you want to put them all in to the broad match type and now you want to start running your campaigns and letting Amazon tell you from there what additional search terms you’re missing and which ones should move to phrase and exact. So you are essentially bypassing the whole first step that you were doing before. Steve: It’s more like a structured automated campaign so to speak, meaning you’re starting with the baseline? Jeff: That’s a really good way to explain it and I think what Brandon was trying to explain earlier is that we don’t suggest that you stop doing auto targeting campaigns, but you want to get your broad match campaign really going first and then you want to look at your auto targeted campaign maybe a little bit more down the road to find some additional keywords, because you’re going to keep the bid on that really small at that time. Steve: Okay and then when you mentioned non overlapping keywords what did it mean by stealing impressions, does that imply that you’re competing against yourself? Jeff: I’ll let Brandon kind of give a technical explanation to that. Brandon: Yeah one of the things we see people do is with the advent of these reverse ASIN tools, one of the tactics we saw people using initially was I might have found 400 keywords that my products ranks for, or my competitor’s product ranks for and they just take all those to the sponsored product campaign and then they start running ads on them. But what ends up happening is a lot of these keywords will be specified, only end up getting one or two or five or ten clicks, and so your budget gets spread out among so many keywords that it’s hard to figure out which ones are working and which ones are irrelevant just because there’s not enough density of clicks on any one of them. Brandon: So what we’re trying to do and tell people to use like the non overlapping keywords, what we’re really trying to do is like figure out the more broad keywords that you can get more data and more impressions and more clicks around, so that you can make better data decisions on those things. So instead of saying like I had five clicks on that and one sale, you might roughly think that’s a 20% conversion rate, but mathematically it’s a little bit hard to say that because five clicks is just not enough data to really figure out your conversion rate as on a large scale. So if you can densify those around broader keywords and you can get keywords that have 15 or 20 or 50 clicks around them, you can make a lot better data driven decisions at that level. Steve: Does that imply then that the phrases that you should be entering in to Amazon should be like relatively short ones like two or three words at most? Brandon: That’s probably the case in most things, it depends on the size of your niche, and I like our use case of the word apple slicer in this case because this is part of what comes back to a little bit of art to this. If we want to go very broad we could just say apple but then the human intelligence will tell us apple is going to be a very poor performing keyword because there are so many searches for apple, they are probably intending to buy an apple branded phone or iPad or something. So you have to figure out how to use your human intelligence along with the data in this case to figure out like apple slicer is probably a good search term, it’s going to have enough velocity without being too niche, but if I start specifying apple slicer red, that’s going to probably drive down – it’s going to make it a lot more specific and get a lot fewer impressions and clicks on that. Steve: Just to clarify for the listeners, so apple slicer if we bid on that on a broad match whatever Amazon will come up with would contain apple and slicer but in any order in the entire phrase? Brandon: Yeah that’s correct, that’s kind of the definition of a broad match is that it will take the words you specify in any order along with any other words in there as well. Jeff: Steve to add, for those that are visual learners we’ll give you a piece that you can attach in to your show notes that’ll give people a kind of a visual representation of auto versus broad versus phrase versus exact, so they can kind of see how all of these kind of work in with one another. Steve: Okay yeah I’m just trying to clarify all these terms for the listeners just in case they don’t have a strong grasp, but yeah that would be an excellent resource that I’ll attach for sure. Jeff: Yeah and Steve I think this is where it really comes down to understanding sponsored product ads is really understanding that it’s both an art and a science. Steve was joking before we started hitting the record button and he might throw some of this back end, but Brandon and I play off of each other, because Brandon is much more of the science kind of guy, so he’s looking for the hard science behind something to make a decision. The whole idea of overlapping keywords is that if you don’t have enough data you can’t make a decision, but there is also a real art to a lot of this which is that everybody has to kind of decide how much data they need to make a decision, because to get statistically correct you need a lot of data, and so a lot of the methodologies that are taught aren’t necessarily based on statistical correctness, they are just based on a little bit of gut and a little bit of science. So as a seller is learning to master sponsored product ads they really have to realize that this is not a part of Amazon or a part of selling that you can set and forget, so when you’re doing your follow up email reviews, you come in and you set that whole process up and you move on and you deal with something else. Sponsored product ads do require the seller to understand their own product, understand the numbers and to keep checking on them on a somewhat regular basis, so it’s not something that needs daily attention, but it is something that needs to be looked at on a regular basis. Steve: I think it can be interesting since you guys are kind of yening yang, then we can use the apple slicer example. It would be interesting to see how both you guys approaches would be different for the apple slicer, and where you guys would differ in terms of the gut versus the data. So how would you guys proceed, so which keywords would you bid first on apple slicer, and then what would be like your process for refining the campaign? Jeff: We’ve probably been working together for too long on the term apple slicer that will be, but I’ll go first and then let Brandon kind of correct me. So I did exactly what Brandon said, the first time I ran a campaign I went and I did a reverse ASIN, look up for ten of my competitors, I did a duplication of all of the lists, I put all the keywords into a broad match campaign and I let them run looking for the data to kind of give me the answer. I had a lot of overlapping keywords that were stealing impressions from one another and to be quite honest with you I had a frustration point where I basically took the whole campaign and I threw it away because the data wasn’t making any sense to me, and I just didn’t feel like I had the time and the energy to continue to do it. So the idea of the overlapping keywords makes a lot of sense and as I cleaned up my campaign with the removal of overlapping keywords, I was able to get more data. But it still provides a big hole in my mind because the data is not conclusive, and so I’m willing to take action on things that have a lot less clicks, I’ll take action on something that has between five and ten clicks and choose to move it to a broad or an exact match. I think that’s probably the biggest area where Brandon and I differ. And this tactic works wonders; and in fact it is not uncommon to get a ridiculous return on investment. So for example Greats Footwear, who is a ReferralCandy customer, is currently seeing a 20X ROI. Referral word of mouth marketing is also useful for building up your social media presence as well, because everyone is talking about your company with their friends on Facebook and Twitter. I’m just curious like if you could out spend your problem, like if you put more budget on a daily basis, could you bid on more overlapping keywords and still get the data that you need, or does it not work that way? Brandon: Yeah there is some point to that, you definitely could but you also can’t create impressions on Amazon like there is only so many people searching for things, so just because you spend – you have a higher bid or a higher budget doesn’t mean that you can create 1000 people searching for something in a day, you are limited by actual search line. Steve: So to kind of redefine these overlapping impressions what it’s basically doing is it is diluting your data set across a bunch of similar keywords so that it is harder to collate the data, right? Brandon: Yeah so if you go back to – and just examples like a really good case for when I was looking at his campaign he had done all like 200 keywords or something in there and a lot of them would have two clicks three clicks and maybe you have three clicks and one sale, maybe we’d have three clicks and zero sales. Statistically I look at that and I can’t really tell statistically the difference between the two. And Jeff was more of like I’ll take a look at it, and three clicks and with zero sales might mean I’m going to turn that one off and set it as a negative keyword. When you spread yourself out like among all those keywords you’re kind of forced to either make those decisions early or wait a really long time and spend a bunch of money along the way. Steve: So there is no upper limit on the number of keywords you would suggest when starting out, just make sure that they aren’t overlapping, right? Jeff: I think we’ve evolved in our recommendations and I think that when you’re really getting started try to target between 50 – so campaign organization, we’ve defined three areas of success for sponsored ads. Campaign organization is number one, we can talk a little bit about that because we haven’t really mentioned that, keyword selection is number two and then optimization is number three. So when you’re doing your initial broad match campaign maybe you shoot for like 50 to 100 keywords. I don’t know that today I would go for 200 or 300 or even 1000 keywords because more is not better. Amazon still treats those broad match terms and finds the actual search terms. So there is a difference, there is a keyword which is the term that I’m telling Amazon that I want and there is a search term, that’s the term that the buyer is actually using to find the product. If I find the right 50 or so keywords and I put them in the broad match I’m still going to get hundreds and hundreds of search terms based on those keywords, and so I would rather let Amazon really define the search term without having the overlap than trying to define all of those myself so that I can get to the optimization faster because that’s where you start to save yourself money. Steve: Okay so that being said let’s say we do have statistically significant data, what is the next step? Steve: Actually let’s define good data, actually let’s define statistical significance first, how do you know when a keyword is good that you want to actually do something about it? Brandon: This could sound to maybe a mathematical question, there’s a mathematical maybe definition, there’s more of a practical definition. So I think we like to see around 50 to 100 clicks to get started to get you a relevant number of clicks. If you can see 100 clicks and zero sales I would say you would be pretty confident that’s a poor performing keyword, but if you can see 50 clicks with few sales you can have a little bit more confidence than if you had fewer numbers of clicks. So the more clicks you have on stuff the better confidence you can have in conversion rates and that’s your ACOS and all those other metrics. Steve: So your data is or your statistical significance metrics are based on clicks and not necessarily conversions, is that correct? Brandon: Yeah the number of clicks after somebody clicked on something they either convert or not, so if you have say I’ll just use 100 clicks is a nice round number, 100 clicks and ten sales off of that you got a pretty good idea your conversion rate is going to be around 10%, it might be a plus or minus a little bit around there, but it’s probably going to be on that 10% rage. Jeff: So are you looking at ACOS at this point or are you looking at conversion rate? Brandon: I would typically make most decisions around ACOS, the nice thing about ACOS is it kind of bundles into there the actual cost for click as well, so some keywords might perform really poorly, but they also might be really, really inexpensive. So the ACOS is kind of a nice metric because it kind of takes into account both your conversion rate and the cost per click. Jeff: Okay can I stop you guys for a second? Jeff: You guys are geeking out a little bit, so ACOS is the advertising cost of sale because I don’t think we defined that. Steve: Yes that’s a good job Jeff, keep us in line man. Jeff: Yeah and this is kind of where we were talking about Brandon and I ying ying yeng. So one of the challenges is that ACOS is not really defined inside of Amazon, and inside sponsored product ads. It’s not done at the search term level that allows the seller to make quality decisions, am I right Brandon? Brandon: I think the search term report actually reports ACOS and so that’s data, I don’t know that Amazon kind of defines it in a couple of places. We can get a little specific definition you want to go there but in general it’s just kind of an overall performance of the keyword and you think about [inaudible 00:36:31] like it’s a well rounded one because it takes into account conversion rates and cost per click. It’s a good sort of in metric to look at. Jeff: Yeah I think what I was trying to say sorry was that it’s a number that you can get to within the report but you have to download those reports; you have to build pivot tables off of those reports to be able to take action off of that data. It’s a little bit challenging in the current interface of sponsored product ads to use ACOS as a metric. This is also where I differ from Brandon because Brandon is very scientific and he says 50 to 100 clicks and I look at heaven I say I’ve been running my campaign for four months on one of my new products and I still don’t have 50 clicks on some of my search terms. So I’m willing to take action on things with a lot less clicks, I’m willing to take action on things with five to ten clicks and start making decisions because I might not get to a statistical relevance with some of my number. That’s where the art of this comes in and it’s not just a straight science. Steve: Interesting so you’ll make decisions off of five or ten clicks assuming there is a conversion in there, right? Jeff: Correct, so if I have ten clicks with no conversions I might lower my bid. If I have ten clicks with one conversion I might move it to a phrase match, if I have ten clicks with three conversions I might move it straight to an exact match. So I’m willing to take less data and make action on it because I can still redefine what I do in those other categories, I’m just trying to kind of pull out broad when I can make a decision. So if I have ten clicks with no actions I might look at the number of impressions, I might look at the keyword and decide if I need to make it negative or just lower the bid. So that’s really where the art of this comes in because there are so many different things you can do to start optimizing a campaign. You can create negative keywords, you can lower bids, you can increase bids, you can move things from broad to phrase, phrase to exact, those are all the different things that you can start to do when you start looking at campaign optimization. Steve: So a couple of things I just want to summarize based on what you just said Jeff. I actually have a post that shows you how to extract the reports manually from Amazon, it is quite a tedious process and it does involve excel, but ACOS is the number that I tend to look at. But in terms of what you were just talking about Jeff like making these decisions like let’s say you do find a keyword that is working for you, you mentioned a bunch of things, but what would be your next step, and how would you determine what that next step will be once you find that keyword that works? Jeff: So if I find a keyword that works and it’s kind of working, then I’m going to move it to a phrase match and I’m going to try to find other phrases that that keyword is on, and when it’s in the phrase match I’m going to bid more. So I’m not going to necessarily remove the keyword, I’m moving the search term, not the keyword, I’m moving the search term from broad to phrase and I could potentially negative that keyword in the broad. But if my phrase match has a higher bid then that will kind of take over the idea of stealing impressions. So a typical campaign organization is going to have your highest bid with exact and then phrase and then broad. Sometimes you can get cheaper clicks in either phrase or an exact match, and if you start to get cheaper clicks then you want to negative the keyword in broad or negative the search term in broad so that your phrase match is getting the click not your broad match. Steve: It’s interesting that you say that you don’t negative it right away and you just rely on the higher bid, is that something that you always do? Jeff: I don’t always – this is where the science — the art comes in. I don’t always do it; some of it is a little bit of a gut and a little bit of a decision. So to be honest we use a system now that has built in some intelligence and can make some recommendations to us so that we don’t have to use the pivot tables, but back in the day of kind of using the excel spreadsheets and the pivot tables, I would probably take a little bit more of a hard line and when I move something from broad to phrase I would negative it in broad just to kind of clear it out and keep my data clean. Steve: Okay just to summarize this for the listeners, the reason Jeff would put the phrase or the exact match keywords as negatives in the broad campaign is so that you don’t end up bidding on both the broad campaign and the phrase or exact match campaign. Jeff: Or bid against yourself. Steve: Or bid against yourself yeah exactly. Brandon I’m curious what your perspective is on this. Brandon: From my perspective as a software developer I’d say it’s much easier to always do something than just remember what you did and what you didn’t do, so I don’t see any harm in setting it as a negative keyword. So I would suggest every time you move something from broad to phrase you might as well set the phrase as a negative match on the broad campaign, there is no harm and it kind of shows that you do what you intend. Steve: And when you’re deciding like what to bid, what are some guidelines, like say you found this working keyword like how much do you up the bid? Brandon: So the bid is just a mathematical decision, besides most people have like some target ACOS for all they’re trying to hit, whether that is 30% or 100% depends on your products, but if you’ve got a goal of 30% and you know the conversion rate is whatever maybe 15%, you can do some math and figure out exactly what the appropriate bid is. Steve: And like the follow up question to that is you just mentioned a 30% ACOS, let’s just assume that most people on Amazon have a 66% margin, which basically means that 30% ACOS is almost break even right, what is your philosophy on that, do you try to just break even in hopes that Amazon will just bring you more organic sales, or do you actually try to make a significant profit on your Amazon sponsored ads? Brandon: Well it’s different concepts for different phases of your products, different things, so I would say there’s definitely some sort of halo effect that goes on, it’s pretty well understood I guess if you use sponsored products to drive sales that you will rank better organically and thus sell more organically as well. So that’s a very common strategy is just to at least break even on your sponsored product sales and understand that you’re going to rank better somehow organically for the halo effects. That’s a really common thing we see. Jeff: What Brandon is saying there is if you’re launching your product that’s where you might want to consider your ACOS even being 100% and being okay, that’s the same as kind of the old incentivized review, you’re giving your product away for free. If you have a mature product and you’re just trying to grow your sales, then you might be looking at whatever profit margin you want from that and if you’re trying to maintain your rank or even increase your rank, then that’s where you might want to go more to that break even. So it kind of depends on what your goals are within your business. Steve: Okay, we’ve talked a lot about – we’ve gone to a lot of specifics in terms of running the campaign, I’m just curious how often you guys monitor your broad campaigns to pick out these keywords? Brandon: Most people do it probably once a week or every other week is kind of a good case or what were you going to say there Jeff? Jeff: I was going to say no more than once a week, I think that one thing that sellers do is try to over optimize their campaign, and they want to look at it daily and you really have to let the data tell you what the answer is. Steve: I’m kind of the opposite to be honest with you guys like I don’t look at it very often at all, I peak at it just to make sure the ACOS isn’t out of control, because I find that it is kind of tedious to kind of monitor all the different keywords because of all these different steps. Is that what you guys are finding as well? Brandon: If you go down to that route of downloading reports and putting it on pivot tables I can see that that will be super tedious to do over and over again. Steve: I’m just curious I mean you guys talk to a lot of sellers, is that what people do right now? Jeff: I think a lot of sellers start sponsored product ads, they run it for some period of time, they were probably running an auto targeted campaign, they lost total track of what to do when trying to download their reports. They looked at it from a very, very high level, they determined that it was either profitable or not profitable and they turned it off. I think there is a next set of people who were learning how the data works and went into some optimization and then there are a small group of people who have learned how to terribly kill it if you will. Steve: Okay, I’m going to attempt to kind of summarize our entire 40 minute discussion up to this point, and you guys can just poke holes in case I’m saying something wrong. But it sounds like the first step is to use a tool like Scope and do a reverse ASIN, find out what keywords are ranking for some of the best selling products, and then include those search terms in a broad campaign to start out with. Make sure you’re not using overlapping keywords and then gather some data and depending on whether you’re Jeff or Brandon you can use your gut or go straight on statistical significance, find out the keywords that are converting and then start refining them into phrase or exact match campaigns, increase the bid on those so you dominate those keywords, meanwhile putting those in negatives for your broad campaigns, rinse and repeat. Jeff: Yes, but I’ll give three things on that. One is that don’t optimize too early, so make sure you get your initial data, don’t over collect and don’t over optimize, and I think that you have to let that data kind of collect and sit and get to some type of level to make a decision. So if you make a decision on a keyword today, you have to basically restart your timer if you will and let more data collect before you make the next decision. You can’t come in tomorrow and change that same keyword or search term. Steve: Okay and one thing I didn’t touch upon was the increase in bid, what was the methodology there, like let’s say you’ve found a good keyword, like how much would you up your bid for example in the apple slicer case? Brandon: So I think up it by around 20%, if something is performing really well, 10 to 20% is a nice way to make proper bid. If you raise it by 10 or 20% and it’s still performing well you can keep raising a little bit. At some point it doesn’t make sense to increase, if your bid increases way beyond what your cost for click is you’re probably already behind and increasing your bid more beyond that doesn’t do you much good. Steve: How often do you check, so at some point like your ACOS might be out of control too, so how long do you wait before checking? Brandon: At the beginning weekly or biweekly patterns is pretty useful and works well for a lot of people, so checking it once every week or every other week. It’s pretty good to check into – obviously if you’re spending tens of thousands of dollars a month on your campaigns you might want to check into it more frequently, but if you’re spending $100 a month you don’t have to do it as often. So it depends on your business model and your risk tolerance level there, but the more you spend on the product the more often you want to check on it I suppose. Steve: Okay as I mentioned before like one of the reasons why I don’t monitor that often is because it’s tedious. So I want to give you guys the opportunity, I mean I really thank you guys for coming on the show today, but I did want to give you guys an opportunity to talk about your latest tool that kind of automates the process. So go ahead and describe how it helps and how it simplifies this entire process. Brandon: So I guess I’ll start off from the sciency side, so from a sciency data driven guy I find it really intriguing to go through and like learn about all this stuff and then make algorithms to help the computer implement it. So that’s essentially what our tool does, it takes most of the best practices that we learn from talking with people, from talking with our sellers, talking with customers who bought it, it takes all those for the best practices I think including all those steps we just talked about earlier in this show, and it kind of makes it so you can organize your campaign center in like the best way and automates and makes suggestions around all these same things that just talked about. Steve: So by suggestions, that implies that I don’t even have to look at the data for the keyword like it will just tell me what keyword is doing well then I can click a button and move that to an exact or phrase match campaign? Brandon: Yeah Jeff tell him the specifics, we’ve got the data geek version or the Jeff version or the Brandon version. Steve: For this question by the way I have not used this tool yet, I plan on using it, I’ll probably report my results on the blog but – sorry Jeff I didn’t mean to interrupt, go for it. Jeff: No you’re okay, so I think that the way that Ignite works, so the Seller Labs tool is called Ignite, and if you look at it from just a straight Amazon seller experience we connect to either an existing campaign or you can create a new campaign. We attach that campaign to your product, we give you suggestions of keywords, so we can actually help you make the keyword suggestions, we do the duplication for you, and we start running your campaign. It’s all integrated directly in with Amazon sponsored product ads, so there is no more need to kind of look at something on an excel spreadsheet and then go back in to managing your campaigns. Then all of our managed campaigns, the Ignite managed campaigns have suggestions built in to them. So as the data becomes statistically accurate and you actually have a control over what we call the confidence of our recommendation, we make suggestions to either add a bid, decrease the bid, move something from broad to phrase, broad to exact, add negative keywords, archive a keyword because it’s not performing. So we look at all of these things and we really optimize your campaign based on the ACOS that you define for your campaigns. So you come in and when you set up the campaign you tell us I’m shooting for a 20% or a 40% ACOS, and then all the suggestions that we make are based on the ACOS that you’ve told us that you’re targeting. So what sellers really like about our tool is that you don’t have to download search term reports anymore and do all the pivot tables, we actually have all the detailed search term reports in our tool, and if you’re kind of the more data geeky guy you can dive into that data and take action right from those reports inside our tool. Steve: Okay, I mean one thing that I find extremely tedious about PPC is you’re running these broad campaigns and there is going to be phrases that you want in your negatives and it’s really tedious to go through and add those negatives. Does your tool actually add those negatives or ask me where I just click the button and just throw those into the negatives in the campaign? Brandon: Yes, so we’d actually paused down those search term reports automatically and you can browse through them and there is a call, there’s an actions button over the left hand side that you can choose to set up those negative keywords just right there. Steve: Okay yeah that would be profoundly useful for someone who does this. Guys thanks a lot for your time. If anyone wants to find you guys or check out your tools, where can they find you. Brandon: The best way to do it is just go to sellerlabs.com is our website; we’ve got a bunch of these resources around sponsored products at sellerlabs.com/ppc, it’s got a page on, it’s got some blog posts, some of our videos we’ve done about it and links to some resources about it including a link to sign up for a trial of Ignite. Steve: Yeah for everyone listening out there I’ve actually used scope and I find that Scope is a tool that allows you to do the reverse ASIN look up on the keywords, and I actually look forward to try Ignite and report on my results. Jeff: Yeah we would love for you to give it a try and be able to report on what you’re currently doing versus using the tool. Anyone can go to sellerlabs.com/ppc, have a whole host of resources there to learn more, we covered a lot of terminology so if you’re kind of new and you got lost, there is a lot of terminology definitions on that page. We also get into some of the methodology and we break these down into some of the individual components. I think ultimately this probably wasn’t the most exciting podcast for people to listen to, but sponsored product ads are clearly something that all sellers on the Amazon platform need to understand, and they are becoming more and more important to how you overall run your business and for your overall product success. If you’re not running product ads and it’s not part of your current vision, then you’re really missing out on a significant potential revenue source in the Amazon platform because they do dedicate a lot of space to the sponsored ads on the mobile side, the application side as well as the desktop side for Amazon. Steve: Yeah, hey Jeff I’m going to have to disagree with you there, I think the listeners the reason they listen to the podcast is to get like really in-depth and nitty-gritty on the stuff, and I think we did a pretty good job of that today. Jeff: Yeah I think we did. Sometimes Brandon and I have to – we hang up from these things and we say well did we go too far, did we not explain enough things. So yeah give us feedback, let us know if we didn’t go deep enough and you want us to go deeper, share that and we’ll keep an eye on the blog notes and comments there as well. Steve: And for sure like I always do these case studies, so I’ll be definitely doing a case study on this just to kind of report on my results at some point, but yeah thanks a lot both to you for coming on the show. I learned a lot and I’m sure the listeners will get a lot of value out of this. Jeff: Hey Steve, how about I give away a six months free trial of Ignite for people that have listened all the way through to the end and now know about it. Steve: Yeah that sounds good, when this goes out I will create a contest in fact and that would be great man, that sounds like a great giveaway. Jeff: Okay so you can kind of decide how to pick the winner and we can have them post or something and pick a winner and we’d be happy to do that. Steve: Yeah that will sound great. Thanks guys. Hope you enjoyed that episode. As you can probably tell Jeff and Brandon really know their stuff and we kind of geeeked out on Amazon ads, and if you also couldn’t tell this episode was recorded a while back and I’ve since been using their tool Ignite to manage my campaigns. For more information about this episode, go to mywifequitherjob.com/episode160. Not only does it save time, but it also makes managing your Amazon campaigns so much easier too. So head on over to sellerlabs.com/steve and sign up for a free 30 day trial, once again that’s sellerlabs.com/steve.